Farmer Ranganath Watpade made a killing last year by putting off selling his onions until four months after he harvested them. This year, the same trick has backfired. The country has produced a record harvest, but many farmers in the onion bowl of Maharashtra have lost a large share of their crop damaged in storage, adding to the country's inflation woes. A doubling in retail prices across major cities is especially troubling for staples such as onions, an ingredient that is present in just about every Indian meal. Unseasonal weather, hoarding and price manipulation have in the past led to dramatic price rises, and the new administration of Prime Minister Narendra Modi is anxious to avoid the political fallout that has hit other governments over the cost of the food. Supply shocks like these complicate the government's task of battling weak growth and inflation. It also underlines the irony of high food costs in India, which after China is the world's biggest fruit and vegetable producer. Finance Minister Arun Jaitley's budget on Thursday will have to navigate through these issues as he must address inflation while steering away from populist measures such as food and fuel subsidies. Annual wholesale prices in May rose to a 5-month high of 6.01 per cent. "The only solution is imports, but that can't be done overnight," said R.P. Gupta, director at the National Horticultural Research and Development Foundation. Prices are unlikely to calm before December. Planting of the new season crop has been delayed by scorching heat and subdued rainfall, blunting the affect of emergency measures by the government aimed at getting supplies to market and keeping a lid on prices. "At the time of storage the bulbs looked good, but as I started pulling them out last week I realised that the ones at the bottom of the heap were rotten," said Watpade, 62. On a recent visit, most farmers from this tiny village 200 km (125 miles) north of Mumbai were busy picking rotten onions from stocks piled up in fields or in makeshift sheds. In spite of the experience in Watpade's village, India's onion production was estimated at a record 19.3 million tonnes in the year ending June 30, up nearly 15 percent from the previous year. But that has been too little to calm prices. Heavy rains in March also hit the crop grown for seeds, making quality seeds scarce for planting in the current season. "Last year the seed price was 400 rupees ($6.70) per kg. This year the price has jumped to 1,700 rupees per kg. "And even at this price, we are not getting quality seed," says Sampat Watpade, another local farmer who has cultivated onions for four decades. The two farmers are not related but, as is often the case in Maharashtran villages, they share the same family name. Higher seed prices and now a subdued rainfall during the monsoon season are likely to reduce the area under summer-sown crops, says Gupta of the horticultural foundation. Even crops that are planted will have lower yields, he said. Rains have been 42 percent lower than normal since the June 1 start of monsoon season, but in Maharashtra the shortfall has been 72 per cent. The lack of water has sharply reduced the amount of seedlings grown in nurseries for transplanting. The planting delay will cause severe onion shortages from August to November, a festival period in the South Asian country when demand will rise, said Changdev Holkar, a director at the National Agricultural Cooperative Marketing Federation. 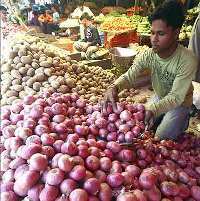 The government has curbed exports, urged state governments to crack down on hoarding and let farmers sell onions directly to consumers. Such moves may curb speculation, but will not increase supplies, said Holkar. "Since the crop has been lost and planting has been delayed, supplies will remain tight until December." Indians eat 15 million tonnes of onions a year. The country exported 1.36 million tonnes of onions in the year through March 31. Last year, India imported a few cargoes of onions from Iran, Afghanistan and China. But large-scale imports are not possible as few producers have big enough surpluses to meet India's demand. "India is considered to be an exporter. If it starts large-scale imports, then prices will gallop in the world market and imports would become uncompetitive," said Holkar of NAFED.